Fighting Selfishness On Our 35th Anniversary Vacation, and a Day in Milan, Italy. Have you ever stayed in a hotel with a bad bed? How about a bad pillow? For me the pillow is often the biggest factor in sleeping well. The Venice Times Hotel probably had the best bed/pillow combo for a great night’s sleep of any hotel I’ve ever been in. And just like that, it was 5am and I was ready to wake up and explore. That made one of us! Two valuable life lessons are that of being flexible, and considerate of others. Forcing a 5am wake up on Sheri would have been selfish so I laid there until 6am until she was ready to wake up. Forcing 5am would have also fallen into the category of “How’s that working out for you?” Haha. Sheri and I are similar in so many ways, but in our morning routine, we are opposites. I like breakfast and coffee right away, she likes to wait a while for breakfast. Although my morning routine wanted to head straight down to the restaurant for breakfast, eating breakfast by myself felt selfish. This was after all, our 35th anniversary celebration. I decided to use the hot water kettle in the room and make some coffee and wait for Sheri so we could eat breakfast together. I think one of the things married couples wrestle most with is selfishness. When we spend our time “taking” rather than “giving” we really set ourselves up for conflict and failure. I also find that this happens mostly in the little things. String a few “little things” together, and you’ll end up with big things. Again, this falls into the “how’s that working out for you” category. I haven’t met anyone who likes to live in the crazy cycle of arguing and fighting. I’d suggest a good first step is to get over yourself and quit being selfish. Let that become a habit, and you’ll have a lot more peace. The words “breakfast buffet” can have a lot of meanings when staying in a hotel. This hotel was had a really nice breakfast with an assortment of scrambled eggs, bacon, meats, fruit, breads, and pastries. Now were were ready for our adventure. I wasn’t sure how much I would like staying a block away from the train station, but it ended up being awesome. For one, you could never hear a train. For another, we were one block away from connecting to all of Europe! We opted for a 2 hour train ride to Milan. That seemed like a good option for a full day trip to see a historical city we’d heard about all our lives. Although I was a little nervous about buying train tickets and actually getting to Milan, it was actually a breeze, and finding our train was easy too. All the train routes were well displayed. We had the option of buying a first class or second class ticket. That triggered a bad memory. In the Solomon Islands, first and second class boat tickets only had a $5 difference in price, but a BIG difference in quality. First class was on the top deck with a half working air conditioner. Second class was in the hot, cargo dungeon. In Italy, the only difference was between a cloth seat, or a leather seat for $30 EU more. We bought the second class seat, saved the money, and that was just fine. The train ride was scenic and very peaceful, with views of beautiful farm land, historic buildings, and gorgeous water fronts. Once we arrived in Milan, we scoped out one of our favorite, low cost things to do in big cities, the Hop on Hop off bus tour. There were 3 routes in Milan. 2 of them would allow us to see all of the big tourist sites and be done in time to catch the train back to Venice. My favorite site was driving past the little church where Leonardo de Vinci painted “The Last Supper.” I was filled with awe being so close to a place where such a big historical event occurred. The city was filled with great architecture as most of Europe is, and offered lots of photo ops. One of the strangest things about this bus trip was that on both lines, Sheri had a headset that had English in one ear, and Italian in the other. We thought it was weird the first time, but when it happened on the second bus, it was kind of freaky. Who knows, that could be the secret to learning languages faster. After the bus tour, we walked down some seemingly empty streets which is always a little unnerving. In the daylight I have a lot more courage and sure enough, a few streets later, and we were at a busy intersection filled with shops and restaurants. We made our way into a little deli and had an amazing green and fruit salad! Somehow we resisted the force of the bread that was everywhere. Bread is both of our weaknesses! Once we started walking, we were a little heated up, but found a little water vending machine on the street corner. The only problem was that you needed some sort of prepaid card to use it. Fortunately there was a really nice man who noticed us struggling like the tourists we were, and he offered to use his card to fill our bottles. He was from Argentina and spoke a little English. Between his English and my Spanish, we enjoyed a nice conversation. We made it back to the train station with time to spare and had a nice ride back to Venice. We were both bobbing our heads on the trip as we were in need of a power nap. I set my alarm just in case I fell into a deep sleep and wound up somewhere in Europe that I did not want to visit. For those of you who have traveled to Europe, you know how easy it is to get around on the train. I would highly recommend it from our Rookie point of view. 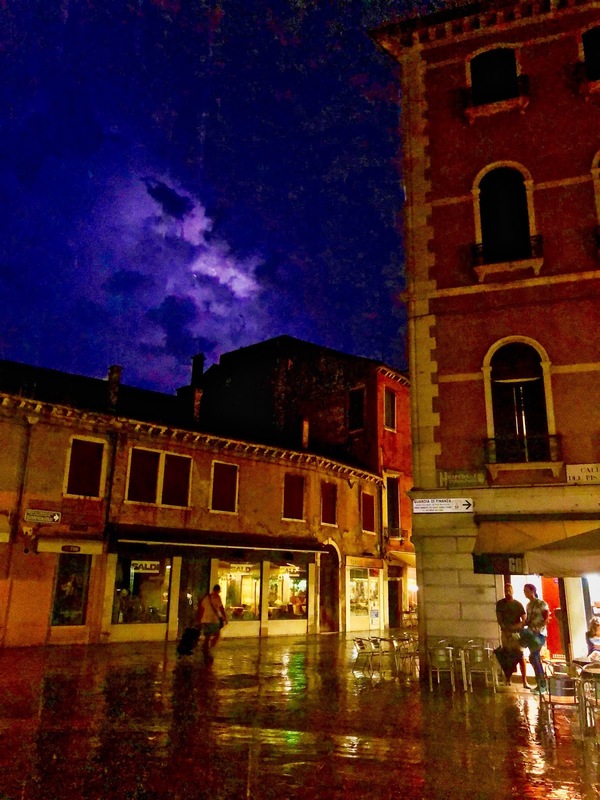 After dinner on the rainy streets of Venice, we were tapped out. The next day we’d board our cruise to Greece so we both wanted this sleep to go by fast. We had more amazing places to visit! Stay tuned and we’ll take you there. 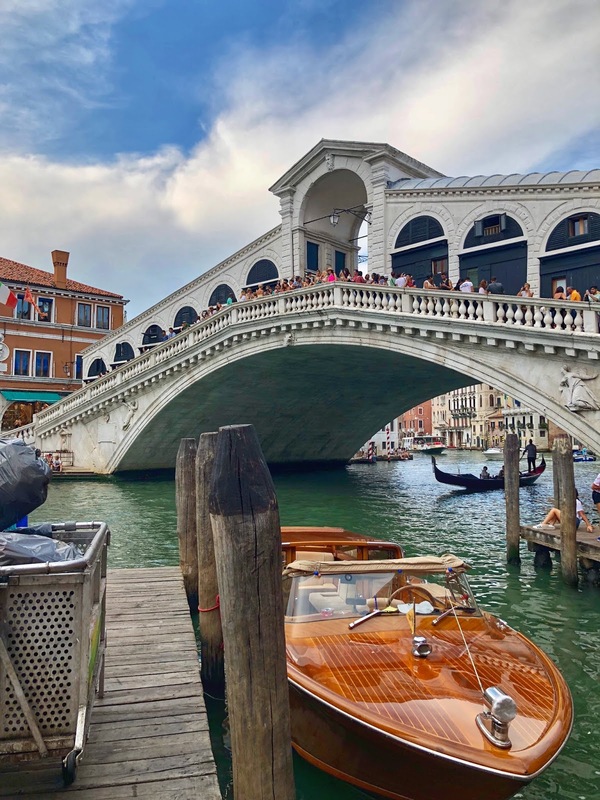 The smell of pizza, the color of gelato stands on every street, the busy water taxi’s and gondolas making their way down canals, could only mean one thing...We’re in Venice! Two years of saving and 2 weeks of quality time and rest were upon us. Our Greek cruise would get its start in Venice, Italy. This trip was somewhat planned in that we knew where we would sleep each night, but a bit free-styled as we did not pre-arrange any tours. For two pretty calculated people, we were looking forward to figuring things out as we went along. Turns out, this strategy would end up being our favorite vacation of all time! 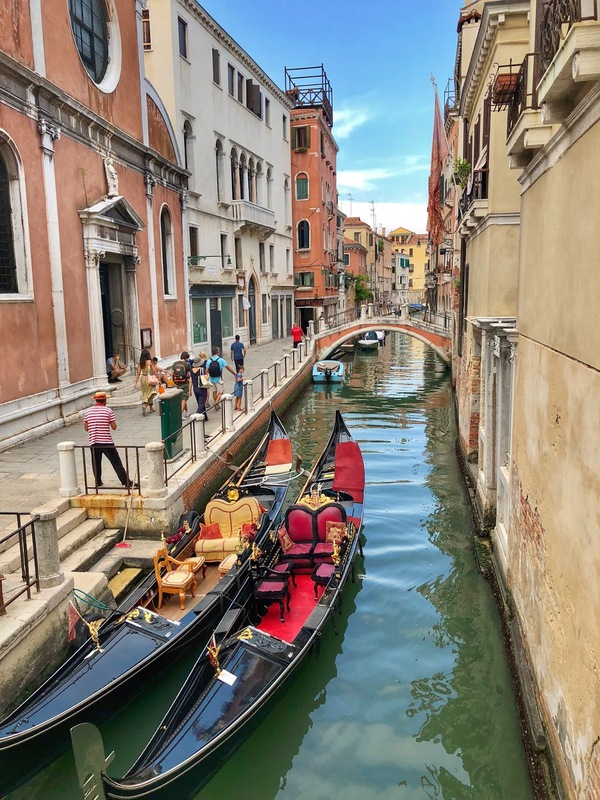 We hope you’ll enjoy the tour and learn a few helpful things along the way if a Venice or Greek cruise is on your bucket list. First things first...as we arrived at the Venice airport, I looked for a local SIM card option for my phone, a much cheaper way to stay connected. 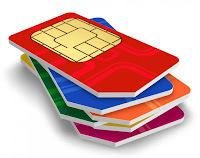 My AT&T account has a feature that allows me to pay $10 per day for phone, texts, and data, but the local Vodaphone SIM card was good for all of Europe and gave us 8gb for only $40 euros. We paid the $10 extra because Facebook, WhatsApp, Messenger, and Skype did not count against the 8gb. AT&T is good for Canada and Mexico, but for other parts of the world, I find a local SIM card to always be the best value. Focus on data. For our 2 weeks, 8GB was plenty to surf the web, get emails, post photos on Facebook, and make data calls on WhatsApp & Messenger. Now for the first adventure...trying to figure out how to get to our hotel in the heart of Venice. Taking a taxi was the obvious choice because there were a ton of them at the airport, but we knew that could be costly so we asked around. For $14 euros, we got on a public bus that took us straight to the main bus station in Venice. It was the number 5 Aerobus. This was a double connected bus with a pivoting center. Sheri and I sat near the pivot point which made juggling our luggage quite a feat for the next 30 minutes. It was well worth the effort as a water taxi would have been $120 EU for a one-way ticket. Knowing what I know now, I would have bought a multi-day public boat and bus combo ticket that included the Aerobus to and from the airport. 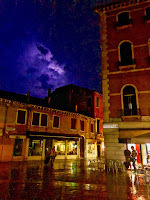 If you are going to Venice...do this from the start and you will have unlimited travel around Venice at a great value! So the bus got us most of the way there. Water taxis were taking off everywhere near the bus station when we arrived and were a little intimidating, but we just started asking around for help. We were told to walk across the bridge and down the path, past the train station, and our hotel would be nearby. 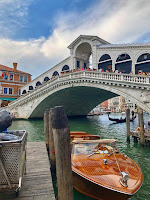 So that “bridge” was about a 50-meter bridge that crossed the Grand Canal and had stairs going up and down both sides. It was pretty hot out so carrying a 70lb suitcase up and down a big bridge would definitely be a workout. Of course, porters were there to carry bags for a fee, but I needed a workout and didn’t want to pay so we carried our bags. As we crested the bridge, we could see Venice was hopping with people! Thanks to Google and a local data SIM card, we walked right to our hotel. I’m confident we never would have chosen this hotel if it wasn’t for Trip Advisor. The Venice Times Hotel was tucked away down a little, narrow alley and was very unassuming...just a quaint little boutique hotel. Walking in we were greeted by a wonderful staff who gave us the lay of the land in a very concise presentation. I was immediately impressed by two things at this hotel...they gave us a FREE android phone to use during our stay with unlimited data and free calls anywhere around the world! Wow! Who does this? The second thing was that the wet bar fridge that was fully stocked, was completely FREE for the first round of snacks. It was water, sodas, and juice, but still, a nice touch to not charge for these. I could tell this hotel was going to work out great! Trip Advisor has never let me down yet. 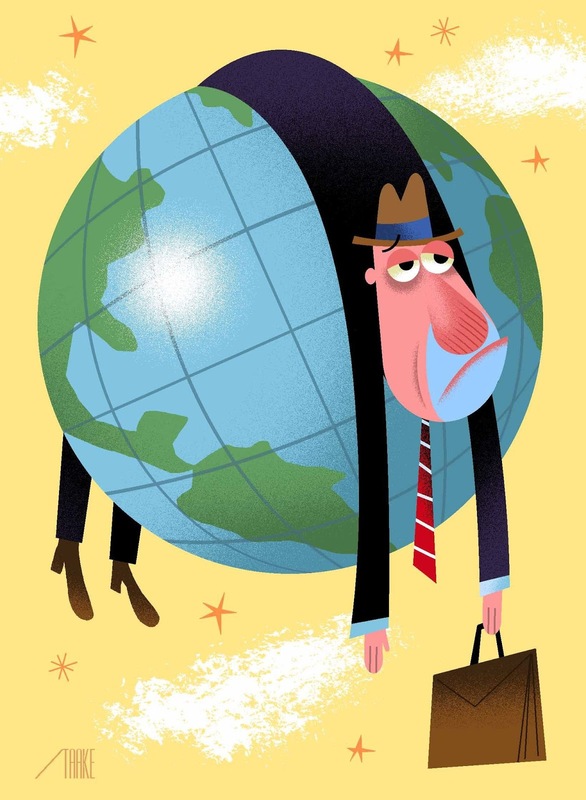 People ask me all the time if I get jet-lagged from all my travel. When I say “no” people often wonder how that is possible. “Discipline” is the key! After a long flight, our body was telling us to sleep, but discipline was telling me not to listen, as that would usually mean a short nap that would turn into a sleeping marathon! Since it was only about noon, we decided to lay down for a brief nap. Without discipline, we knew this could have started our body clocks off on the wrong foot. Getting up after an hour nap was pure mind-over-matter because we probably could have slept for 4 or 5 hours! 1 hour proved just right, as we woke up refreshed and ready to explore. We also got a regular night's sleep that night. 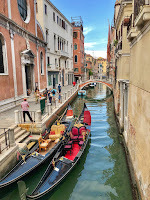 We had always seen pictures of the Grand Canal, the gondolas, and water taxis. We were not really sure how big Venice actually was. Would we get lost walking? Would we walk for hours and not reach the end of the canal? Fortunately, our hotel staff let us know we could make the walk from end-to-end in about 30 minutes. A piece of cake right? Well, we still had to wind around on busy little streets, which were many times more like tight alleys where we feared we’d get lost. Between some well-placed signs, and following the crowd, we made our way just fine. You really can’t get too lost in Venice. It was a little toasty outside, so after getting back to the hotel, we cooled off, then decided to look for a dinner spot. 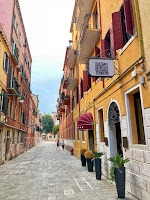 Another inside scoop from the hotel staff directed us to cross the bridge near the hotel and enter into the local side of Venice on the other side of the canal. We were told we’d find a quieter area with some restaurants and shops that were priced more for locals instead of paying high tourist prices. The suggestion paid off and was a very nice evening away from the crowds. We didn’t really have to walk that far to get there. Just cross the bridge and the vibe totally changed. We found a small little Italian restaurant and ordered some lasagna and pizza. Before long, a busking guitarist set up right near our table and gave us what felt like our own private flamingo guitar concert. He was awesome! For dessert, we found a gelato shop which is pretty easy to do. They are everywhere! Pistachio for me and some Mango sorbet for Sheri, and our night was complete! There was more food to experience, more sites to see, but we were tapped out on Day 1. We were already planning how we’d mix it up on Day 2. Venice could not contain us. Where would we end up? Stay tuned.